La Mer isn’t your typical skincare brand. But you already knew that, right? Ever since the company was acquired by Estée Lauder in 1995, La Mer has been regarded as the skincare line that luxe-beauty lovers stockpile and those who can’t afford the hefty price points dream about. There’s a reason Crème de la Mer ($170), its most popular product, has such a cult following, and it’s not because J.Lo allegedly used to slather it all over her body. The truth is that La Mer works, but the science behind its successful line of products is anything but conventional. I was lucky enough to get a sneak peek at the Max Huber Research lab in Melville, New York (What? Did you think it was in Paris? ), where all of the, well, research and development behind the brand is conducted. 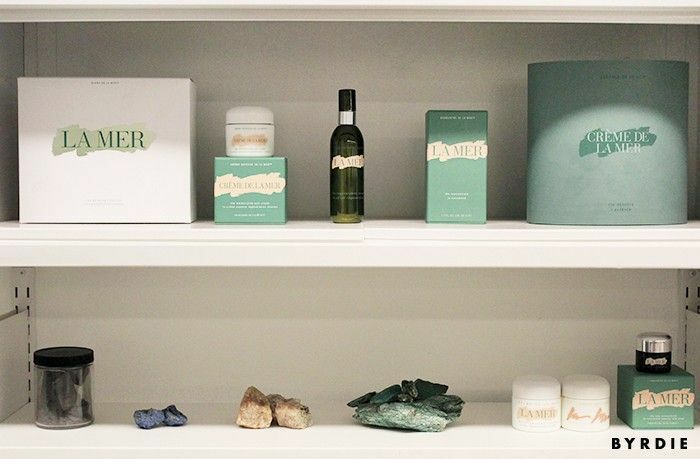 At the start of the tour, Andy Bevacqua, VP of research and development for La Mer, sat down with us (i.e., a group of hungry beauty editors dying to know how this miracle skincare line is crafted) to talk about how he got into the business of formulating La Mer. He started out at Estée Lauder, but when word broke that a man (Huber) had crafted a cream to end all creams, the company wanted in on the action. Huber was a NASA physicist who suffered major burns from a lab incident, and in his quest to find the develop the product to heal his skin, he formulated Crème de la Mer out of his home in California. “As a young formulating chemist, this was really foreign to me. I didn’t really understand what that meant—electrical properties of the skin? Back then, no one was talking about skin having electrical properties. But long story short, I failed. I spent about a year trying to duplicate the cream and make something that felt a whole lot like it, and you know, I even got it to smell similar to Crème de la Mer, but it really did not have the performance, and we moved on from there,” says Bevacqua. The Lauder family tried to purchase the formula from Huber several times, but he was never willing to sell it. Ironically, after he passed, Huber’s family contacted the Lauders and asked them to come in and translate his lab into a recipe, as Huber had kept his special elixir a secret. Considering the fact that sound machines, electrical wires, and fish tanks were present, they needed a chemist like Bevacqua to make sense of it all. “When I first walked into the lab, I was totally overwhelmed, and that’s really, I think, when my obsession started with the La Mer brand, because what I saw was many little vessels of cream that had these metal plates inserted in them with wires coming out of them. They were all like in a series; there must have been at least, I don’t know, a dozen or more little pots of cream and these weird noises, or sounds, and light flashing. I guess it hit me at that point that I really didn’t fail [at trying to replicate the cream], because there’s no way that I could have ever imagined what this process was,” Bevacqua explains. At the heart of every La Mer product is Huber’s Miracle Broth, a mixture of sea kelp, vitamins and minerals, citrus oil, eucalyptus, sunflower, wheat germ, and alfalfa, all of which is fermented together. Another key ingredient in every La Mer product is Huber’s Lime Tea Concentrate, a solution of lime rinds and alcohol (originally, Huber used 100-proof vodka). It works as an antioxidant to “keep skin in its happy place,” says Bevacqua. With all that alcohol, “happy place” seems like an appropriate label. After learning more about the science behind La Mer, we began our tour of the facility. But walking through the lab wasn’t exactly what I expected. After hearing about the “sound baths” that the ingredients go through as well as just knowing how luxe the brand is, I imagined a super-chic and glamorous atmosphere, but it was your standard setup: stainless steel tables, cabinets, machinery. But in a way, this was a pleasant surprise. The ingredients were stored in glass jars—they weren’t pretty, but they’re historic and true to the brand. What worked for Huber decades ago is still the same process that’s packaged today, with additions here and there for each new product. Speaking of which, La Mer’s newest launch, The Moisturizing Soft Lotion ($260), has a multi-layer delivery system of the Broth, the Lime Tea Concentrate, and a layer of emollients (non-cosmetic moisturizers like creams and lotions) placed inside a gel capsule that’s designed to be incredibly small so that it can deeply penetrate the skin. Clyde Johnson, executive director of education, events, and spa experience for La Mer, describes the Soft Lotion as a totally new brand experience: “The kind of effects that [the consumer] will notice is the skin will be much smoother and look more even and more luminous as the formula is absorbed. It’s going to be felt in a few different ways: Firstly, the formula is completely weightless on the skin, even though it’s quite rich at the same time—that’s happening through the Soft Lotion gel technology. J.Lo’s not the only fan of the brand. Find out how La Mer’s products help Olivia Culpo look fresh when she travels. Why Don't We Pay More Homage to Japanese Skincare?